Equistro Secreta Pro-Max is a high quality respiratory supplement, formulated to aid your horse's natural immune response to respiratory disease or allergies. It contains 9 specially selected herbs, as well as Vitamin E, which is an antioxidant. 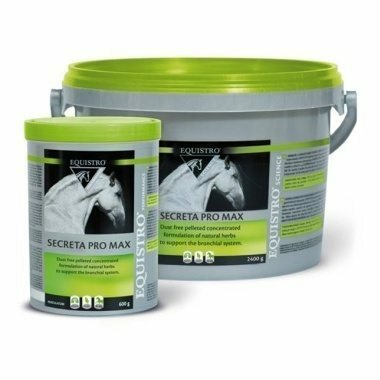 Equistro Secreta Pro-Max contains Grindelia; Coltsfoot; Liquorice; Mullien; Climbing Ivy; Black horehound; Burdock; Grape powder & Thyme. They assist your horse's natural self-cleansing process & appropriate mucus formation in both the lower & upper respiratory tract. In addition, they support the respiratory tract's natural immunity & regeneration.